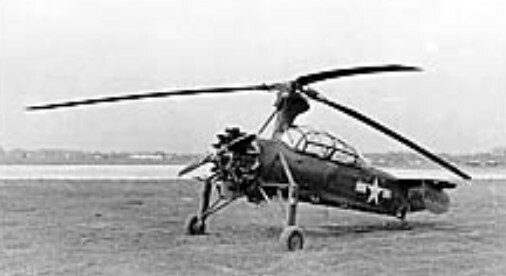 The Kellett O-60 was built and tested as an observation aircraft for the US Army in 1942 while the helicopter was still in development. 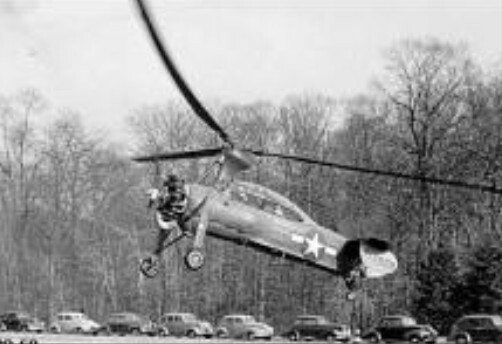 The aircraft had a free-turning 43 ft 2 in rotor which provided lift in place of a conventional wing. A 285 horsepower radial engine turning a two-blade propeller gave the O-60 its forward thrust. The two-place YO-60 was designed by Richard O. Prewitt and could do jump take-offs. The rotor was spun up to about 280 rpm (rotations per minute) at a no-lift angle using the power of the radial engine. When ready for take-off, the pilot would release a clutch mechanism which changed the blade angle to 8 degrees. This caused the aircraft to 'jump' about 10 feet into the air. The engine and propeller then pulled the YO-60 into forward flight as the rotor angle was decreased to a normal flight pitch of 3 degrees. The engine was only used to spin the rotor up to flight speeds on the ground, while in flight the rotor was free spinning. The YO-60 never got past the service test phase. Seven aircraft were built as XO-60 (S/N 42-13604 to 42-13610) with 225 hp radial engines and later re-engined with 285 hp. radials and redesignated YO-60. Engine: Jacobs R-915-3 of 285 hp. Fuselage length: 20 ft. 9 in. Height: 10 ft. 3 in. Rotor diameter: 43 ft. 2 in.